It’s getting harder by the minute to get whole sites ranked well in Google. Discover the two important reasons why and what to do with your SEO and marketing to gain new traffic. Backlinks are the backbone of Google. Links from one site to another are the main way Google discovers new sites. The site generating the link is an outbound link. The site being linked to gets an inbound link. The more inbound links a site has, the more authoritative Google thinks that site is. Since the advent of social media, more folks are simply sharing links to other content on those platforms rather than creating a link to it on their own site. In other words, the very thing that Google counts on for site discovery and ranking when it crawls a site is in super sharp decline. Go have a look at the charts on this guest post by Glen Allsopp on Pat Flynn’s Smart Passive Income blog for yourself. You’ll see the dramatic decline in backlinks. The post above is all about how to create content that will generate backlinks. That’s important. It is an indicator of authority on topic and content folks want to see. But the plain fact remains that no matter how good your content is, you may never get a lot of backlinks. It’s just not appropriate for most of my clients to share links from BlogAid on their sites. My clients are crafters and foodie folk and such. So, while my followers are interested in my content, their followers are not, hence no backlink. Some of my webmasters share my posts because they are in the same business I am. But that’s also why more of them don’t share my posts. They need to keep their clients for themselves because we offer some of the same services. That’s not a problem for me personally, as there are plenty enough site owners to go around for all of us. But it is a problem for my site in not getting more backlinks. All that said, content marketing is not dead, it just has to be done differently now. And so does your SEO. As of April 2017, the World Wide Web Size reports the Indexed Web contains at least 4.51 billion pages. But Statistic Brain reports that In 2014 Google crawled 30 trillion pages. While Google will never give us current stats, it’s safe to say that there are a LOT of pages/posts on the web for it to crawl and rank. Getting your site to stand out in that multitude is becoming nearly impossible. Because of the sharp decline in backlinks on sites, Google has made strategic partnerships with two important social media platforms – Twitter and Pinterest. In this post on Search Engine Land, Eric Enge, of Stone Temple consulting, recaps a session he attended at SMX West where several speakers shared data on this very topic. Toward the end you’ll find remarks about Mark Traphagen’s presentation, also with Stone Temple and my fave SEO guy, about Google’s partnership with Twitter in 2015. Mark explains how Google has tweaked its algorithm to sort out the avalanche of tweets to pay attention to only those that get the most likes. In other words, quality content that gets engagement matters. I don’t have a recent study to cite about how Google and Pinterest work together. But I can tell you from my own experience that Pinterest is favored in SERPs. Many of my searches start on Google and end on Pinterest. So, it’s worthwhile to pay attention to your SEO on both your site and on Pinterest. And the role of social media with regards to SEO will have to continue to expand. I expect Google will do whatever it has to in order to collect the data it needs to determine what’s hot online. The moral of this story is, it’s a lot easier to rank a single post than a whole site anymore. That means creating high quality content that gets engagement and shares, instead of mass producing junk posts for quantity, is key to your online success. 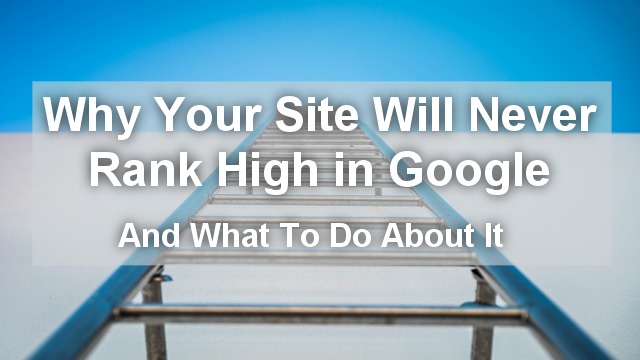 It also means that laying a proper SEO foundation on your site, and optimizing the content on each post is critical too. The problem is, most folks are using SEO tactics from 2012. And those just don’t work anymore. Tactics like chasing that green dot of approval in an SEO plugin and ignoring all its other SEO settings. I see that all the time in site audits. My highest ranking posts that have been driving traffic to my site for 3 years get orange and red dots. And if you’re getting a lot of green dots, you’re probably keyword stuffing. Google hasn’t worked like that since semantic search took over in 2013. Ready for Better SEO on Your Site? Check out my DIY SEO course and SEO Workshops. And start creating content to establish yourself as an authority on the topics you cover and the role your social media efforts play.